Polish students of Information Technology (IT) won the 31st annual World Finals of the Association for Computing Machinery (ACM) International Collegiate Programming Contest (ICPC) in Tokio. The Polish group won by solving eight from ten highly complex computer programming problems, modeled on real-world business challenges. Polish IT students from the Warsaw University: Marek Cygan, Marcin Pilipczuk and Filip Wolski were in the winning team. Second place went to the team from the Tsinghua University from China, students from Sankt Petersburg were third, and fourth – to a group from Massachusetts Institute of Technology. More than 6 thousand teams on 6 continents participated in the regional contests held last fall. The top 88 teams have qualified for positions at the 2007 ACM-ICPC World Finals championships. The ICPC is the world's most prestigious university competition in computing sciences and engineering, according to ACM. 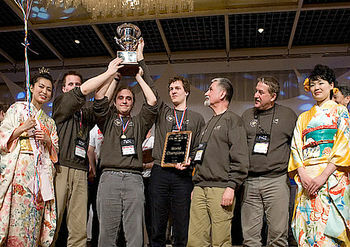 The best IT students from around the world compete in the ICPC every year. Professors from the Warsaw University - Krzysztof Diks and Jan Madey – looked after the Polish team. The WU students won first prize four years ago. Students from the Jagiellonian University (Krakow) won the second place in 2006 and the team from the Wrocław University took the fifth place in 2005. 300 million PLN for the research and development of high-tech foresees the Government programme “Technological Initiative”. The programme, managed by the Ministry of Science and Higher Education, will support the innovative ventures using the Polish scientists inventions. It should improve the financing of scientific research and implementing its results into the economy practice. It will enable the leading of own R&D projects in the enterprises. Entrepreneurs may already submit the applications for the grants. Companies conducting research for their own purpose as well as scientific institutions – the latter will have to prove that the results will have its practical application in the economy. On Monday, the 19th of March, the Government presented a project of economic reforms that is called colloquially "the package of Mr. Kluska". It foresees many facilitations for the entrepreneurs. The package estimates the reduction of bureaucracy, shorter time (three days) necessary to establish a business, company registration in “one-stop-shop” and decrease in the number of burdensome inspections. There are two special legal acts in the packet. The first one concerns the freedom of economic activity and the second - the tax identification number. – Implementation of the “one-stop-shop” in the Inland Revenues will be possible in the first quarter of 2008 – said the Vice Minister of the Treasury, Michał Krupiński. It won’t bring about any significant costs for the offices – he added. The “the package of Mr. Kluska” envisages a possibility to file an application for establishing a company electronically. The package will soon be placed in the Sejm. On Friday the 16th of March the Sikorsky Aircraft Corporation closed on its acquisition of aircraft maker PZL Mielec from Industry Development Agency (ARP). The transaction is worth several hundred million Zlotys. Following the previously announced acquisition agreement signed in December 2006, Sikorsky acquired a 100 percent stake in the company, which is based in the city of Mielec. The company currently has approximately 1,500 highly skilled employees. PZL Mielec previously was wholly owned by the Industrial Development Agency (known by the Polish acronym ARP), a government holding company under the Ministry of Treasury. 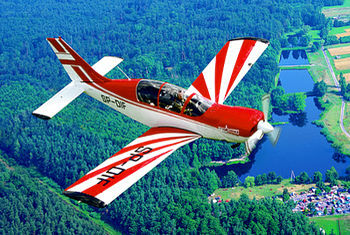 PZL Mielec has been Poland's largest fixed wing aircraft manufacturer. Jeffrey Pino, the Sikorsky's president, commented on the transaction: - This is a major step toward establishing the foundation for our European operations. (…) This acquisition draws upon Poland's great aerospace heritage and expertise and unites two pioneering aerospace companies into an even stronger world-class aircraft manufacturer and service provider – he added. The acquisition will allow the PZL restructuring to be carried out and enable the strengthening of its market position, also by the modern know-how takeover and the extending of product diversification. With the closing of the acquisition, the 1.2 million square foot facility will undergo modernization to support International BLACK HAWK helicopter production while continuing the current capability for aircraft design, manufacture, flight test and delivery. Modifications are slated to begin in April 2007. Sikorsky Aircraft’s investment will strengthen the aviation industry in Poland. It creates new business possibilities not only for the new PZL owner, but also for the other Polish companies from this sector. In 2006, Sikorsky announced the plans to develop an International BLACK HAWK helicopter variant for global customers that would be manufactured using a global supply chain. PZL Mielec will be a key component of Sikorsky's long-range global strategy to meet worldwide demand for its products and services. Sikorsky Aircraft Corp. is a world leader in helicopter design, manufacturing and service. The company is a subsidiary of the American firm United Technologies Corp. (UTC), which provides a broad range of high-technology products and support services to the aerospace and building systems industries. UTC, through its subsidiaries, currently employs more than 7,000 people in Poland in the aviation and building systems industries. An average monthly remuneration in the industry sector reached – 2687,48 PLN. Employment in the industry sector amounted to 5070,2 thousand people. Prices of the sold production were by 0,3% higher than in the last month. It is estimated, that the construction- assembly production prices were by 0,6% higher than in January. The level of the construction - assembly production carried out in the period January-February 2007 was by 58,4% higher than in the analogical period 2006. Prices of goods and services increased in relation to January 2007 by 0,3%. Prices of food increased in February by 0,8%. Prices of goods and services connected with housing increased by 0,2%. Prices of transport were higher than in January by 1,0%, mainly because of the fuel prices increase for private means of transport by 1,7%. Prices of passenger cars grew by 0,6%. In 2006 over 608 thousand passenger cars were constructed in Poland – over 15 percent more than in the previous year. That is the best result in the domestic motorization market since five years. Fiat company achieved the leader position – over 280 thousand cars left its factories last year. The beginning of 2007 looks also quite promising. Samar, the motorisation market monitoring institute, notifies that the Poles buy more and more new cars, both passenger and commercial vehicles. Good sale’s results are also connected with the improving economic situation, as well as the sale-off campaigns of the last season cars. This boom should continue in the coming months. From January till February 2007 there appeared 44 798 new passenger cars, it is 21,6 percent more than in the same period of 2006. In February Poles bought 22 thousand new vehicles – over 21 percent more than a year ago. Toyota inspires the biggest confidence among the customers – the mark has noticed nearly 27 percent sale growth in relation to the analogical period of 2006 (5.955 sold cars). Skoda was in the second place – it sold 24,3 percent more cars than last year (5.588) and the next one is Opel, which reached 4,5 percent growth of sale (4.377). Also Fiat (4.200 sold cars), Ford (3.157), Peugeot (2.956), Renault (2.743), as well as Volkswagen, Citroen and Honda found its place among the “top ten”. A majority of the brands accessible on the Polish market have noticed a growth of sale. Among 42 brands only eight companies observed a decrease of monthly sale in relation to the last year. The production sector of motorisation market also looks promising. 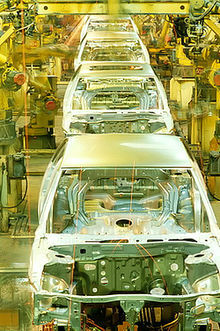 The Warsaw plant Passengers Car Factory (FSO), which projected volume of 2007 production reaches 150 thousand cars (146 thousand – Daewoo Lanos, 4 thousand - Chevrolet Aveo). In January and February the FSO production reached nearly 22 thousand cars. In two first months of 2007 the commercial vehicles sector noticed a sales value bigger by nearly 33 percent than in last year (6.571 cars). Since the last 5 years, this years February sale brought record results – there are 3.625 new delivery vans on Polish roads, it’s nearly 39 percent more than in February 2006. The most popular brand among the commercial vehicles in Poland is still the Fiat – the company gained 22 percent share of the market. Volkswagen is in the second place – it has 63 percent of sales growth and 14 percent of the market. The Renault placed itself on the third position with 13,5 percent share in the market. They are followed by Citroen, Ford, Peugeot and Mercedes. Every fourth white stork (ciconia ciconia) in the world comes from Poland – it’s about 41 thousand pairs. Thanks to these birds Poland is a great tourist attraction for the nature fans from Western Europe. There are only seven pairs of storks in Denmark, 315 pairs in France and four thousand storks live in Germany. The world’s population amounts to 170 thousand pairs. Poland is the only country where a house with a stork nest is a traditional landscape component. 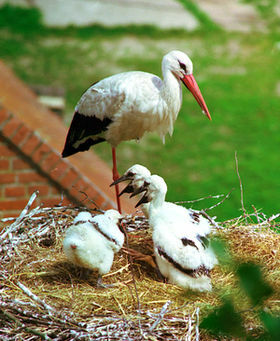 So called “stork villages” (there is from ten to several dozens of nests) are to find easily in the north-east Poland. A small village Żywkowo is the most famous. It is placed on the Warmia-Mazury Stork Route. There is also a village Kłopot in Lubuskie voivodship (west Poland) where a White Stork Museum has been placed on the initiative of League of Nature Protection. Another place worth to see is Tykocin in Podlaskie region, which is called an European Stork Village, for there are more than 1300 stork nests in that region. Storks concentration places are the European tourist attraction. Every year the nature fans come to Poland from Germany, Netherlands or Denmark (i.e. Żywkowo is visited yearly by more than eight thousand people from all over the world) to watch secretly the “family life” of ciconia ciconia. The stork agro tourism flourishes: there are new recreation and hiking trails created (for pedestrians and cyclists) and souvenirs with pictures of storks are improving in popularity. A stork symbol means i.e. a good omen, an abundance, loyalty. Moreover, in March 2007 in Przygodzice (Wielkopolska) a first in the history of science monograph regarding the white stork has been published (“White Stork in Poland: studies in biology, ecology and conservation”). All this accounts for an extraordinary ecological value of Poland. And so a stork – a modest mascot of the Polish exposition on EXPO 2000 in Hannover – promotes successfully the Polish economy in the world. Well, it’s a stork’s life.